Winner of three Academy Awards including a long-overdue one for lead actor Leonardo DiCaprio, The Revenant is a bombastic, visually spectacular and not especially profound B-movie revenge thriller blown up to gargantuan proportions. 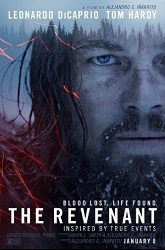 Based on Michael Punke's novel, itself inspired by true events, it's the story of 19th century fur trapper Hugh Glass (DiCaprio) who sets out across the vast American frontier on an odyssey of revenge against the compatriots who left him for dead after a savage bear attack. As Glass trudges towards his destiny, the confrontation with his turncoat enemy John Fitzgerald (Tom Hardy) looms ever closer. With the full force of Oscar-winning Birdman director Alejandro G. Inarritu at the helm, not to mention the input of that movie's legendary cinematographer Emmanuel Lubezki, there's no denying The Revenant's status as an immersive and visceral piece of cinema. Shot outdoors in unforgiving environments in natural light, it was an infamously troubled production that went over budget and put both the cast and the crew through living hell, including DiCaprio who went so far as sleeping inside real horse carcasses for the role. Both the star's noble suffering and the movie's commitment to reality are impressive, but outside the visuals there's less to the film than meets the eye, playing out on a predictable trajectory over a lengthy amount of time. Nevertheless, the movie does have another trump card in the form of its superbly atmospheric score by Japanese veteran Ryuichi Sakamoto. One of the country's pre-eminent and most highly respected musicians, Sakamoto's delvings into the film score world have been relatively infrequent but invariably memorable, from the haunting minimalism of Merry Christmas Mr Lawrence to the Oscar-winning The Last Emperor and The Sheltering Sky. With every new assignment, Sakamoto brings with him elements of both his electronic background (he made a name for himself in 1978 as part of Yellow Magic Orchestra, diversifying into a highly successful solo career) and his classical piano training, seemingly disparate styles that make him an intriguing soundtrack composer. 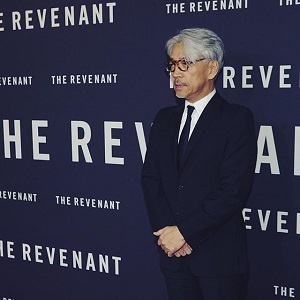 Both of those aspects are very much on display in The Revenant, the score that marked Sakamoto's return to the podium after a battle with throat cancer. Indeed, the composer's ongoing health issues and the sheer scale of scoring the movie meant he requested German electronic pioneer Alva Noto (real name Carsten Nicolai) provide additional music along with input from The National guitarist Bryce Dessner. The latter's presence on the score was in fact directly requested by director Inarritu after having heard a concert piece Dessner composed for the Kronos Quartet. The end result is an intriguing fusion of the orchestral, electronic and acoustic, several of the cues attributed to the individual composers with most resulting from a collaborative effort. Despite the seemingly bitty nature of the scoring process, the end result fuses very effectively. 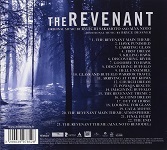 Sakamoto provides the overarching theme in the striking "The Revenant Main Theme", moody strings working in short pulses to reflect Glass' sense of single-minded determination whilst the underlying electronic effects replicate the wind-swept landscapes; as a musical distillation of the film's complex themes, it works brilliantly. The vast majority of Sakamoto's solo cues either develop this central idea or introduce new material: the dark "Killing Hawk" builds Angelo Badalementi-style ambience before the strings cut through the icy gloom like a knife, whilst "Discovering River" and "Goodbye to Hawk" continue in a far more tragic vein, the strings heightened for greater emotional impact; the progression from mournful synthesised flute to cold, unyielding timpani and piano in the latter track encapsulates Glass' emotional journey in a nutshell. "Hell Ensemble" again picks up the central theme, Sakamoto's carefully augmented orchestrations incrementally becoming more expansive as the music steadily unthaws; it's bleak but beautiful music, stylistics that continue in the following pieces "Glass and Buffalo Warrior Travel", "Arriving at Fort Kiowa" (the latter featuring a beautifully expressive cello solo) and "The Revenant Theme 2". "Out of Horse" mixes the processed and the orchestral to genre-defying effect whilst "The Revenant Main Theme Atmospheric" and "The End" bring the central idea to a sense of completion, albeit a suitably desolate and haunting one. Noto's collaborations with Sakomoto flesh out several of the score cues; texturally, said pieces are very similar to the latter's individual work although one suspects Noto's hand in the music's subtle electronic embellishment. The threatening "Carrying Glass" features a bed of growling electronics, culminating in the merest hint of the aforementioned synthesised flute, whilst "First Dream" builds some morose strings to reflect Glass' spiritual visions of his late Native American wife, a presence who eventually comes to guide him through his gruelling odyssey. "Discovering Buffalo" seems to build to a moment of revelation that nevertheless carries the beaten-down, desolate quality that blows through the majority of the score. One of the score's most haunting moments comes in "Church Dream" with both Sakamoto and Noto putting a more conventionally symphonic emphasis on strings, utilising the main theme to convey a profound sense of tragedy and loss. "Second Dream" initially starts out with percussive textures although it doesn't take long for the more darkly expansive electronic textures to take over. The two composers also work alongside Dessner in tracks "Powaqa Rescue", another of those cues that takes its sweet time building to a moment of catharsis that never quite arrives, and "Cat & Mouse", a track that could perhaps be described as the score's most relatively conventional with its jittery strings creating a palpable sense of tension. These stylistics continue in pivotal cue "Final Fight" in which Sakamoto and Dessner (sans Noto) work together, a brutal combination of growling and pounding that expertly captures the desperation of Glass and Fitzgerald's last stand; the final emergence into the strains of the main theme appear to conclude Glass' odyssey in a musical sense although any air of triumphant heroism is nowhere to be found. Dessner's own work can be heard in cues "Hawk Punished" (with Noto) and "Imagining Buffalo" and "Looking for Glass" (both solo). The score culminates with Noto's intriguing "Remodel" of Sakamoto's theme in which the main thematic ideas are further extended through electronic ambience and sound design. 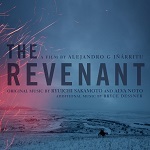 Accentuating a movie's key themes is of course the main aim for any film score, and Sakamoto's work on The Revenant is a superbly intuitive and compelling piece of work. Alongside his close collaborators Alva Noto and Bryce Dessner, he's fashioned a lengthy and demanding yet rewarding soundtrack that expertly takes the listener on the emotional journey of Leonardo DiCaprio's central character, an intriguing fusion of the classical and the modernistic that feels appropriate to both the movie's 19th century setting and also the needs of the 21st century audience watching it. That the score has been shut out of the film's Academy Award success due to the bizarre 'multiple composers' rule is a shame, as it accentuates the visceral impact no end; it also makes one lament Sakamoto's relatively infrequent contributions to film scores as he is certainly one of the medium's most singular voices. The album is available at Amazon.co.uk or Amazon.com.